Disney World’s Animal Kingdom is a zoological theme park with a focus on animal conservation and the natural environment. The park opened in 1998 and now hosts over 12 million guests per year. With around 580 acres, Animal Kingdom holds the title as the largest theme park in the world. But what is truly unique about this park is how it combines traditional attractions with hundreds of species of live animals. With that said, let’s now rank the top 5 Animal Kingdom rides and attractions to prioritize for your next Disney World vacation. Disney’s Animal Kingdom theme park is divided into seven uniquely themed areas. These lands are Africa, Asia, DinoLand U.S.A., Discovery Island, Oasis, Pandora – The World of Avatar, and Rafiki’s Planet Watch. Discovery River acts to separate Discovery Island from the other Animal Kingdom lands. The Tree of Life is a 145-foot artificial baobab tree and is Animal Kingdom’s most iconic feature. There are currently 41 rides and attractions at Disney’s Animal Kingdom theme park. Note that certain Animal Kingdom rides have a minimum height requirement but the majority of the attractions are appropriate for all ages. It’s unlikely that you will be able to experience all – or even most – of Animal Kingdom rides and attractions in a single day. After all, there are 41 in total and you will encounter lines no matter what time of the year you visit. With this in mind, it makes sense to make the best Animal Kingdom rides qt top priority so you don’t miss out on the fun. You may find it helpful to visit our Disney Crowd Calendar and Strategies to Avoid Lines pages to discover the best ways to avoid the crowds. As far as FastPass goes at Animal Kingdom, each guest is entitled to at least 3 FastPass+ selections per day like any other Disney World theme park. FastPass+ allows you to skip the lines at a particular attraction of your choosing so it is important to take advantage of this perk. Since some attractions are more popular than others, you should focus on making your FastPass reservations for the most popular rides and as soon as you are able (up to 60 days in advance of check-in at a Disney resort, or 30 days for guests staying at a non-Disney hotel). We would recommend you select Avatar Flight of Passage as your top priority Tier 1 FastPass+ and head straight to Na’vi River Journey right as the gates open in the morning. Based on expected wait times, we would recommend you select Kilimanjaro Safaris and Expedition Everest as your highest priority Tier 2 FastPasses, and then DINOSAUR and Kali River Rapids as the next couple you may want to consider. We start our list of best Animal Kingdom rides with….a stage show. Yes, we are cheating a little since Festival of the Lion King isn’t a ride. However, we just had to include this one because we feel that no guest should overlook Animal Kingdom’s most popular live show. Festival of the Lion King explodes to life with an array of amazing acting, incredible music, awe-inspiring athleticism, and creative set design. The 30-minute celebration features a variety of entertainment including live music from Disney’s The Lion King’s and a whirlwind of colors and costuming. The highly talented cast includes singers, dancers, stilt walkers, and trampoline acrobatics (performed by the Tumble Monkeys) with pounding beats as the accompaniment. The moving stages and Audio-animatronic add to the spectacle, all topped off with an emotional rendition of the “Circle of Life” as the finale. We voted Festival of the Lion King as #1 on our Best Live Stows at Disney World list for good reason. And if you have time for another Animal Kingdom stage show, be sure to check out Finding Nemo. Both shows are not to be missed! DINOSAUR is one of our favorite Animal Kingdom rides because it combines action-packed fun with stunning visual effects. The plot of this motion simulator track ride takes you back to the age of the dinosaur. It’s your mission to haul a 3.5-ton Iguanadon back to the present day. But in order to complete the task, you must dart around fearsome predators, catch the dinosaur, and get out before a giant meteor wipes you out! DINOSAUR is a frantic, dark, and unpredictable ride filled with bumps, speedy hairpin turns, and close calls, and the high-tech visual effects are some of Disney’s finest. But while the ride is sure to be a hit with most guests, the speed, sounds, and scary predatory may be too much for some children. Kilimanjaro Safaris is Animal Kingdom’s most quintessential ride. If there is one attraction that is an absolute must, then this is probably our top pick. After all, who wants to visit Animal Kingdom without seeing any animals? Here you are seated in an open-air vehicle as you experience a guided tour of Animal Kingdon’s majestic African savanna. Guests will have a chance to get up close to live animals roaming free. But don’t worry- they won’t bite. The ride takes you through Harambe Wildlife Reserve, a 110-acre landscape of forests, rocky wetlands, and tranquil open plains. Your guide will point out the 34 species of aminals residing here and share interesting wildlife facts throughout this fascinating 18-minute expedition. You can expect to encounter elegant giraffes, shy hippopotamuses, intimidating lions high on rocky perches, elephants, rhinos, cheetahs, baboons, zebras, hyenas, and crocodiles. You will feel like you are in rural Africa! As we stated before, no Animal Kingdom visit would be complete without a ride on Kilimanjaro Safaris. Be sure to book your FastPass+ early and bring your camera! Along with Na’vi River Journey, Avatar Flight of Passage is one of Disney’s newest attractions and one of the most popular FastPass choices. We picked Flight of Passage as #2 because it’s just such an amazing experience. The ride opened in 2017 and is located within Pandora – The World of Avatar area and is based on James Cameron’s Avatar film. Avatar Flight of Passage is a 3D flying simulator attraction set in the Avatar universe. The ride is often described as a nice combination of Soarin’ and Star Tours and is one of Disney’s most technologically advanced rides of all time. Guests hop aboard the back a powerful mountain Banshee in preparation to soar across Pandora’s landscape, Humans and Na’vi seek to restore the banshee population to back to natural levels, and you, as part of the avatar program, are linked with an avatar to fly on an Ikran (or “Banshee”) in this Na’vi’s tribal rite-of-passage. This thrilling expedition takes you for an up-close view of the moon’s landscape. The flying effects of Flight of Passage are superb. Guests are able to turn their head in nearly any direction – up, down, and side to side – to survey the Pandora landscape as you fly. We can see why this ride gets so much attention! Who doesn’t love a good roller coast? Fortunately, Disney World has many great ones, and we think Exhibition Everest – Legend of the Forbidden Mountain ranks among the best. 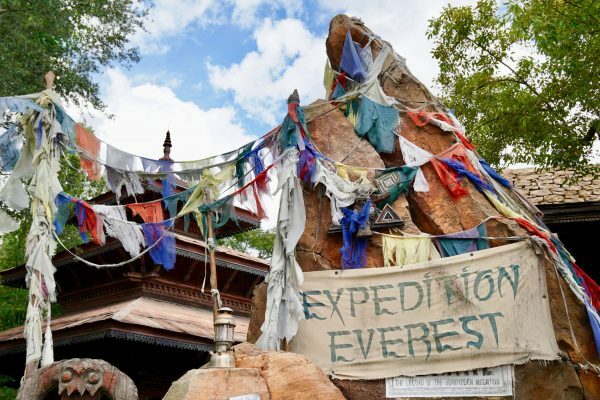 Located in the Asia section of Animal Kingdom, Exhibition Everest is appropriately located in a Tibetan village and at the base of Mount Everest. Here you will board a train to head straight up toward the 200-foot peak of the mountain. But be warned: a legendary snow monster makes his home deep inside the mountain and he doesn’t like visitors. After a steep climb to the top of Mount Everest, your train begins its descent as you hurtle back down the mountain and into a dark cave. Then you happen upon broken train tracks ahead, and the train suddenly reverses course and plummets backward into the darkness. Soon the shadow of a gigantic (and angry) snow beast appears before your eyes! He roars and the train races away before the Yeti makes a meal out of you. The scenery is this attraction is spectacular and the attraction really shines at nighttime. Exhibition Everest is also a relatively smooth ride as opposed to many coasters (which jostle you around). The attraction may be on the scary-side for children because of the frightening visual effects, loud noises, speeds, darkness, and drops. However, for anyone brave enough to board this frantic train, then you will be rewarded with 3.5 minutes of absolute pleasure. Enjoy your trip to Animal Kingdom! We hope our Best Animal Kingdom Rides page helps you prioritize your list of Animal Kingdom attractions. For more useful Disney World information, please review some additional pages on MagicGuides like our Animal Kingdom Restaurants, Best Magic Kingdom Rides, Best Epcot Attractions, Best Hollywood Studios Rides, Disney Travel Agents, Disney Dining Plan Calculator, Disney World Map, and Disney World Weather articles. If you need help planning and booking your magical Walt Disney World vacation, then please contact our friends at The Vacationeer. Their services are always helpful and totally free of charge! Thanks for reading and we hope you have a magical Walt Disney World vacation!